Yoga is a collection of stretches that gradually increase in difficulty. When performing yoga, you not only focus on the part of the body that you are stretching and the performance of the stretching activity itself. You also place great concentration on your breathing, posture and balance. Because yoga is meant to increase with difficulty over time and with practice, you should never experience pain while doing yoga. If you are experiencing pain, decrease the intensity of the stretch until you are able to do the exercise without experiencing pain. Why is Breathing So Important During Yoga? You might think your breathing has nothing to do with your back pain, but you would be misleading yourself. Many times back pain is caused by pinched nerves that swell when they are removed from the pinched state. Proper blood flow can help alleviate some of this pain. When you focus on your breathing, you also tend to focus on your posture. This is due to the fact that proper breathing allows for you to sit or stand in such a way as to give your lungs room to expand. Since poor posture is the number one cause of back pain, your breathing assists you in this area in an indirect manner. It is not uncommon for people who are learning yoga to get excited about the immediate benefits of yoga that you can experience. You should still be careful to make sure that you are being safe about your yoga practices. Some of the poses of yoga require a balance that those who suffer from back pain might not immediately have. Such poses may also put undue stress on the back if it already has problems. Again, if you experience pain while performing yoga, be sure to stop what you are doing and move on to another stretch that is more plausible for you to do without hurting your back more. What Equipment Do I Need For Yoga? 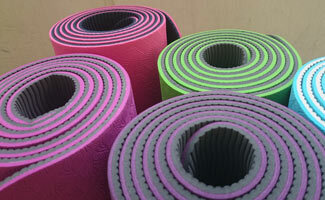 When performing yoga, it is always wise to use a yoga mat (check out this yoga starter set on Amazon). This prevents you from hurting yourself by doing poses on a hard surface. Some poses may also require the use of additional equipment, such as a yoga strap, blanket or an exercise ball. If you are just starting yoga, you can start with the mat and add to the equipment as you become more proficient in your yoga poses. The cobra pose is a simple pose that can be beneficial to bulging discs, but when it is not done correctly or is overdone to the point of pain, it can make the issue worse. If you experience anything more than mild discomfort, discontinue the pose or reduce the amount of strain you are using by reducing the height you are lifting your chest. When you are a beginner, a good test is to lift your hands up so your weight is not on them and this is how much you should be bending your back/lifting your chest until you become more flexible. To perform the cobra pose, lay flat on your yoga mat face down. This is known as the prone position. Place your hands flat on the floor beneath the corresponding shoulder. For instance, your right hand should be flat on the floor, palm down, beneath your right shoulder. Slowly raise your upper body in a stretch. Leave your legs close together in order to obtain a deeper stretch from the position but go slow when doing this backbend. Tadasana is a standing pose and is very simple to do. Stand with your hands at your sides. Hunch your neck and shoulders. Now slowly roll your neck and shoulders back and down so that you are standing straight, with the top of your head straining to reach its greatest height. This is an excellent pose for those that need more focus on posture since you are forcing yourself to use good posture and stand straight. It is also a very grounding pose. In the cat-cow yoga exercise you will be going into the chest stretch position first (referred to as Cow), and then switching to the back stretch position (aka Cat) without stopping between the two positions. Start the position by placing your body so that you are on your hands and knees. Your fingers should be splayed and your arms should be the main force behind your position. Arch your lower back so your chest is scooping towards the front of the mat, your tummy nears the ground and your head is looking upward. Hold this pose until you feel the stretch in your back. This is the cow position. To move from the cow position to the cat position, you will arch not just you lower back, but your entire back in the same way that a cat would. To do this, slowly roll your back into the “cat” position. You should be curved so that you are now looking at your lower stomach. Hold this position until you feel a stretch. Move back and forth between these two poses naturally with your breath. Simply doing this sequence 5-10 times each morning will increase back flexibility and reduce pain a great deal. You begin this position by lying flat on your back. Bring the right knee to the chest and hold it there for two minutes. Slide your right knee to the left side of your body. Turn your right arm and your head to the right side of your body. When you feel the stretch, hold this position for two to five minutes. Ideally, you are working towards getting your right shoulder to the ground. Breathe deeply. Lay flat on your back. Bring the left knee to the chest. Hold the left knee to your chest for two minutes. Slide your left knee to the right side of your body. Turn your left arm and your head to the left side of your body. You should feel a stretch. Hold this position for two to five minutes. Inhale. Exhale. Do you want to start doing yoga but are a bit nervous since you know nothing about it? Don’t worry! Just remember that all experts started out as beginners! Tara Stiles has some tips for your going into your first class. Here’s a graphic that explains the six branches of yoga and a little more about each. No matter how much yoga you do, you should always put great effort into your posture. There are some very simple techniques that you can do which will help to develop and maintain a posture that will leave you pain-free. Push yourself. If you place your finger in the top of your head and try to push against the finger, this will force you to use good posture. You can do this directly, and later on, just think of the finger on your head to correct your posture. Consider using an exercise ball instead of a desk chair. Most of the time when we sit, we are not using good posture. An exercise ball forces you to focus on your core strength and posture. 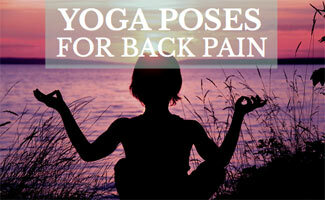 What are your favorite yoga poses for back pain? Great article Sadie! I get occasional back pain and may try some of these new poses out. My favorite at the moment is cat-cow – that really seems to help! Also, as part of my integral hatha yoga routine, I lift my feet/legs up in the air for at least 3 minutes (shoulder stand/ sarvangaasana), and then come down into fish (matsyaasana). Not sure if this focuses on the back but it helps my posture for the rest of the day and seems to align things for me. Alex, so glad to hear that you found this article useful and that you have a yoga pose that helps with your alignment. Thanks for sharing your experience with us and stay healthy and happy!